Sometimes simple soccer conditioning drills are the most effective. With the top touch drill, athletes stand directly behind a soccer ball, which is placed on the ground. They hop from one foot to the other, touching the foot lightly on the ball before hopping to the other foot. This drill is meant to increase their leg strength, their stamina, and their balance. The top touch drill, like most soccer conditioning drills, can be made more difficult in several ways. Athletes can bring their knees up high before letting them lightly touch the ball, or they can be required to keep their foot in the air, never letting it touch the ball. Coaches can also speed up the drill, requiring athletes to hop faster and thereby making the drill more difficult. In this drill, athletes stand holding a soccer ball with their legs shoulder-width apart. Athletes toss the soccer ball in the air directly in front of them and catch it with their arms out straight. As the athletes catch the ball, they should sink into a squat, making sure to keep their knees over their ankles and not letting the legs sink forward over their toes or beyond. This will protect the knees and ensure good form. This drill requires total body coordination and is especially good for teaching young athletes how their bodies work and move. Hand-eye coordination is required for tossing and catching the soccer ball. Core strength is required to catch the ball and prevent the body from jerking one way or the other. Leg and core strength is required for the squat and coming back to start. Athletes should line up in a horizontal line on the soccer field. At the coach’s whistle, athletes take off running, forcing their knees up as high as they will go. This slows athletes down significantly, so coaches should not make athletes run too far. The knee kick drill helps athletes develop core and leg strength, as well as running stamina and balance. Because soccer requires so much running, any drill that can combine running with additional strength moves is a good bet for coaches short on time. In moving jumping jacks, athletes complete jumping jacks but while moving forward. As athletes jump their feet apart and raise their arms in the air, they jump forward. As they bring their arms and legs back together, they stay in place. Coaches can make this soccer conditioning drill more difficult by requiring athletes to jump forward both when they take their feet apart and when they bring them back together. 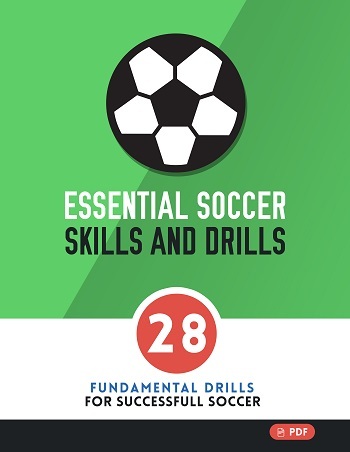 This soccer drill is excellent for developing full-body coordination as well as leg strength and stamina or endurance. It may take athletes a few tries to get the rhythm of this drill, so coaches should be prepared to repeat the drill several times over a period of a few days until athletes feel comfortable with it and can focus on the fitness benefits of the drill.